I love aromatherapy scent blends and believe in the power of essential oils to help in certain situations. 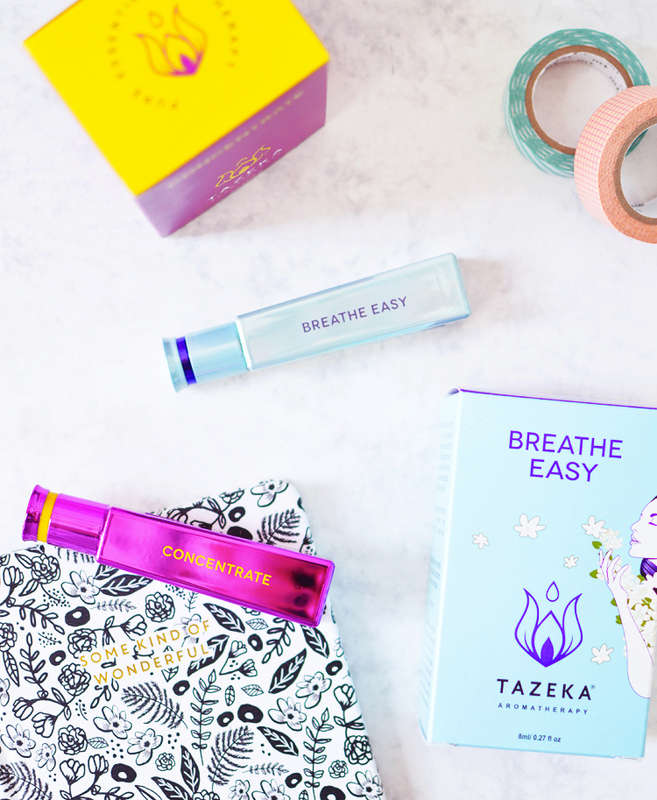 I keep a lavender scented blend in a rollerball by my bed to help me drift off to sleep, and now I've been keeping these Tazeka blends on my desk to perk me up during the day. I currently have two scents; Concentrate and Breath Easy. 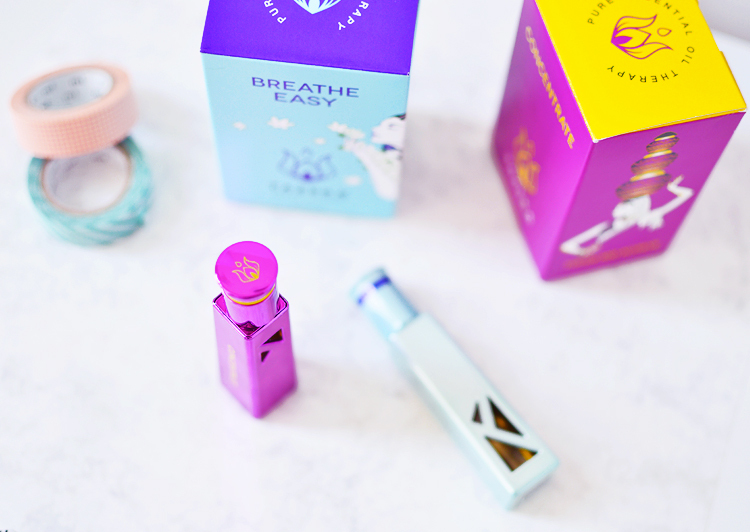 Breath Easy is for times of congestion and perfect for dealing with stuffy noses thanks to its strong eucalyptus scent with hints of lavender, cypress and pine. Luckily I haven't needed to use this properly yet but I do enjoy giving it a sniff and putting a little on my wrists occasionally as I love the scent. Concentrate has my name written all over it. I need all the help I can get when I have the attention span of a gnat some days. This blend combines rosemary, laurel leaf, coriander, grapefruit, petitgrain and jasmine to make a harmonious spicy sweet scent. It's a little delicious and seriously refreshing. Rosemary and Laurel were used by the ancient greeks to help spark inspiration, light mental fires and keep the flames of knowledge burning. Were they crazy or really onto something? Perhaps it's a little of both. I've been keeping Concentrate on my desk for the past few weeks and reach for it whenever I need a little oomph. Rosemary and grapefruit are the dominate notes straight off the bat, perfect for inhaling deeply and thinking 'you got this' to yourself whilst trying to hold back a yawn. 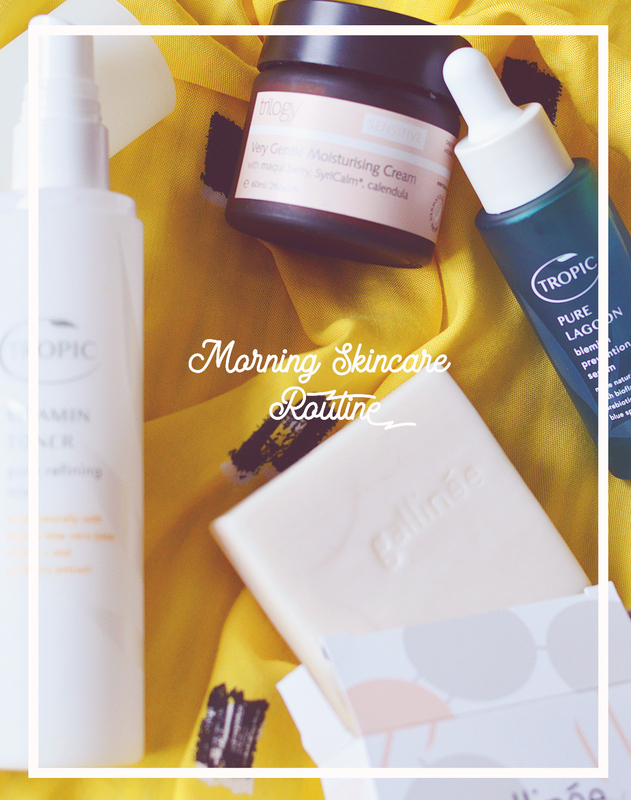 It quickly calms down and then I can smell more jasmine, and maybe the laurel, though... I'm not sure what laurel smells like off the top of my head so don't listen to me. Whatever it is, though, I like it. The oil comes housed in a glass rollerball that is protected by colourful plastic casing which also prevents leaks. I dropped mine onto hard flooring and had one of those slow-mo stomach turning moments praying it would survive, and it did, there wasn't even a mark or scratch on the plastic so it does it's job very well indeed.